Pamper yourself with a Threads facial. We offer a variety of customized facials to perfectly fit your skin’s needs. So, no need to choose your facial ahead of time. Simply inform us of your selection of 25, 50 or 80 minutes and our experienced esthetician will thoroughly analyze your skin during your facial to ensure you will receive the correct facial for your skin type. Our exclusive facials include hand-formulated products which uniquely integrate knowledge from advanced science with the ageless wisdom of traditional Ayurveda. An express facial great for those with limited time or just wanting to test the waters. You will experience a thorough cleansing and exfoliation under steam, and a soothing face massage which will finish with a layering of therapeutic serums. *Those wishing to have extractions and mask treatment included, should opt for a 50 min or 80 min facial. Result: express rejuvenation! Following a cleansing, you will experience a gentle, yet effective manual micro-dermal abrasion treatment (or enzyme treatment for more sensitive skin). This will allow the layering of aroma therapeutic products to deeply penetrate to the cellular level where the transformation of renewal begins. All facials (except 25 minute) include extractions and mask (face pack treatment). While your mask is resting, an intense hand, arm and neck massage is performed. 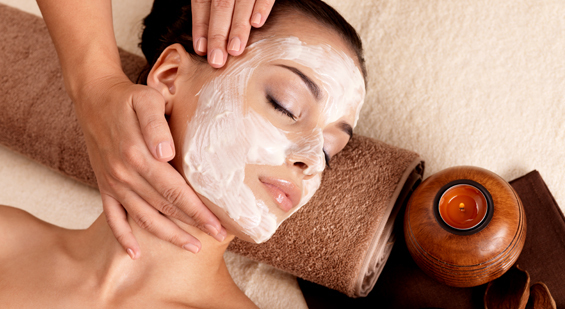 Upon mask removal, you’ll indulge in a therapeutic and rejuvenating Ayurvedic facial massage. 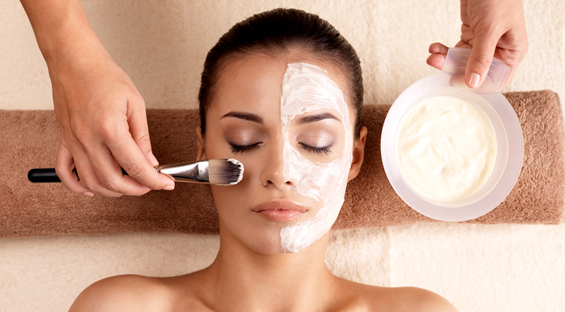 Each facial will finish with the application of intensely active, regenerating and nourishing products. Result: total relaxation! All the benefits of the 50 minute facial but with the addition of a traditional Ayurvedic foot massage. A Tibetan balancing bowl containing copper, silver and brass is used to massage feet and bring balance to the whole body. Result: total out of body bliss! The rock star facial will bring radiance to skin put through the wringers of a party lifestyle. Ancient and progressive ingredients such as Red Sandalwood, Manjista, Napca, Amla, Neem, Tulsi, Monoatomic Gold, Rhodium, Iridium, Cinnamon Bark, Thyme and Lavender will stimulate circulation, oxygenate, purify, reduce puffiness and even skin tone. Oily, dull and congested skin will all benefit from this aromatherapy treatment and glow from the inside out. So all you rock stars can feel free to party on knowing you can come in for this facial the next day. Changes in the weather can really dry out skin to the point where it hurts! Sea Algae Extract, Rosebud, Fennel and Red Coral Powder, Gotu Kola, Green Tea, essential oils of Turmeric, Ginger, Cardamom, and Ylang Ylang are warming, nourishing and ultra hydrating for dry, dehydrated skin. You will finally be able to say goodbye to tight, flakey skin. Specially formulated for Rosecea, sunburned, sensitive or inflamed skin. This facial will soothe, hydrate, cool and soften your skin back to pure calmness. Nourishing Algae, Hawaiian Seaplant Extract, Spirilina, Brahmi, Cucumber and Sweet Almond Powder, Neem, essential oils of Sandalwood, Blue Chamomile, Mimosa and Rosemary are just a few of the tasty herbs responsible. Let’s face it. Gravity exists! This facial will assist with firming and hydrating your delicate facial skin. State of the art ingredient concentrates include stabilized, soluble Vitamin C and ATP (nature’s cell energizer), Alpha Lipoic Acid, Coq10, Algae and Seaweed Concentrates, Phytoplankton, Saccharomyces Extract (high level beta glucans), Amino Acid Peptides (found in skin structure), Monatomic Gold, Rhodium and Iridium (super energy conductors). Acne sufferers need this facial! This treatment is the perfect detox for your skin. Neem Leaves, White Camphor, Lavender, Tulsi and Papaya Leaves will oxygenate and draw out impurities. After thorough extractions, Aloe Vera, Rosemary, Tea Tree, Lemon Balm, Antioxidant Vitamins and Alpha Lipoic Acid will repair and calm inflamed skin as well help to balance sebaceous glands. This treatment finishes with a calming pressure point massage to help you feel inner and outer peace. Treat your neck and décolleté to an oxygenating and firming indulgence. This treatment will give the perfect glow to all the right places before your special date. Eyes will be lined with a freshly prepared treatment. Dark circles or puffy eyes will feel brightened and deflated with this ultra hydrating and soothing treatment. Also great for dry, itchy eyes due to hay fever allergies. Adding this unique peel to any of our facials will enhance your treatment. Your skin will be indulged with an effervescent burst of natural Vitamin C and Oxygen to instantly brighten, tighten and hydrate your skin through a unique combination of natural enzymes and fruit acids known as alpha hydroxy acids. This peel will also allow for deeper penetration of therapeutic serums and treatment oils, giving you a hydrated, plumped and dewy appearance from deep within the skin. We will finish with an application of Zinc and Titanium sunscreen which is also recommended to be used as a part of your daily routine after receiving your treatment. A great treatment for dry, rough hands and arms or that have become hyper-pigmented due to age or hormones. We will exfoliate first with a microcrystal treatment and then apply our unique 2 step Oxygen Vitamin C Peel. Arms will then be massaged with an ultra-hydrating brightening mask. We will finish with an application of Zinc and Titanium sunscreen which is also recommended to be used as a part of your daily routine after receiving your treatment. A therapy to calm any vata (anxious) energy. Warm medicated oil (sesame oil base infused with essential oils and herbs) is poured in a continuous, soothing stream onto the third eye (energy chakra) and forehead to ease tension and worries. Once the oil is poured, the excess is squeezed from your hair and the remaining oil is massaged deeply into the scalp. It is commonly used in India as a treatment for migraines and persistent headaches. In order to get the full benefit of this treatment, we highly recommend that you plan to go straight home and relax afterward. Many of our clients have reported having the best rest of their life after receiving our Shirodhara. You can choose to rinse out the oil after a few hours or leave it in overnight as a conditioning treatment. You’ll love it! Hands and feet are luxuriously pampered and rejuvenated with a cleansing followed by a moisturizing mask for hands, and a stimulating, anti-microbial mask for feet. Age spots and skin discolorations on the backs of hands are treated with an active natural skin lightener followed by a deeply moisturizing aroma therapeutic massage. Feet are treated with a western massage using an invigorating, refreshing anti-microbial foot oil and finished with a traditional Tibetan balancing foot bowl. Hands and feet are awakened, moisturized, smoothed and softened while your whole body becomes energized yet feeling relaxed and nurtured. Click here to schedule a facial at our Dublin location.